Vaccinations have proven to be successful in preventing serious and often fatal diseases. However, vaccinations, if improperly manufactured or handled, can pose a risk of harm to patients. 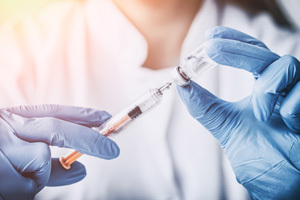 A recent press release from the Kentucky Department of Public Health reports that numerous patients who have received vaccinations administered by Location Vaccination, a vaccine provider, have subsequently developed infections at the injection site. Location Vaccination provides vaccine services to businesses in Kentucky, Ohio, and Indiana. The Kentucky Department of Public Health’s press release indicates that patients affected by Location Vaccination’s vaccines received their vaccinations beginning September 1, 2018. The Kentucky Department of Public Health has indicated that the reason for so many patients developing infections is improper storage and handling of the vaccines. Such conduct can be attributed to human error – i.e., someone failed to follow ordinary rules and guidelines to ensure vaccines are properly stored for safety and effectiveness. Additionally, patients who have developed infections from Location Vaccination’s vaccines are likely not protected, as the vaccines may be completely ineffective. Therefore, patients are instructed to not only seek immediate medical care if they develop a vaccine-related infection, but they should also consider being re-vaccinated to ensure the effectiveness of the vaccine. Can Patients Seek Compensation for Their Injuries? Reported injuries associated with vaccines received by Location Vaccination include redness, pain, swelling, and the development of lumps/nodules at the injection site. While these injuries may seem minor, there may be patients who have suffered more extensive injuries or illnesses that have gone unreported. Also, because certain vaccines administered by Location Vaccination may be ineffective, patients who have received these vaccines may be at risk of developing a serious and potentially fatal disease they have sought to be vaccinated against. To be eligible for compensation, patients must demonstrate that they have suffered an illness or injury that has caused them substantial harm, such as lost wages, extensive medical bills, and in some cases, permanent injuries. At this time, many patients are recovering from infections resulting from defective vaccines administered by Location Vaccination, but we still do not know the entire story. There may be additional patients who have been hospitalized or suffered debilitating and permanent injuries directly caused by improperly stored and handled vaccinations. Have you or your loved one suffered an injury as a result of a vaccine?